Brides that don’t feel like wearing a veil on their wedding day now have a wide selection of stylish alternatives when it comes to matrimonial headgear. If you’re getting married on one of Thailand’s spectacular soft sandy beaches, you will most likely want to plan a wedding ensemble that wows just as much as the stunning location. 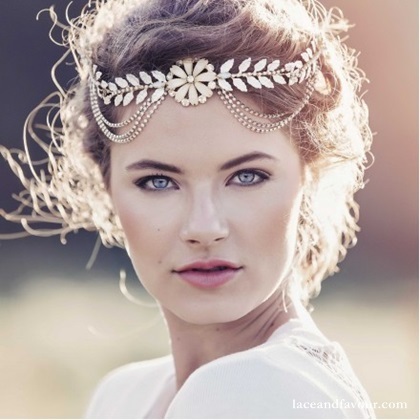 For quirky brides who enjoy breaking away from fashion convention now and again, donning stunning head pieces instead of the traditional veil could be just the way to make a style statement. Whether you prefer a colourful flower crown or a bejewelled family heirloom tiara, it’s vital to select head or hair accessories that match your gown and your chosen hair style on the day. If you’re in need of some heady inspiration, below is a selection of inspiring ideas. If you want to go for a classic look without wearing a flowing veil that the sea breeze is going to blow around your face throughout the wedding ceremony, a tiara is the classic choice. A dainty, understated design will help you achieve the elegant Kate Middleton effect, whereas there are plenty of styles that will allow you to make a dramatic statement on your big day. There’s a plethora of styles to choose from, whether you fancy wearing your hair loose or in a chic up-do. This floral diamante design (pictured) is a boho twist on traditional tiara styles, but still ticks all the boxes when it comes style. If you’re a bit of a hippie bride that fancies getting married with the sand between her toes, then a dazzling flower crown may just be for you. Your Thailand-based wedding planner will be in touch with an array of expert florists who will be able to put together a gorgeous band that not only matches your colouring and your gown, but also the colour themes of your wedding day. Bear in mind that the style of your flower crown should always complement your dress, so if your gown features plenty of embellishment already then you’re probably better off going for a simple, understated design. If you’re not afraid of making a strong fashion statement on your big day, then perhaps a bridal forehead band is the perfect piece to complement your ensemble? This bold floral design (pictured) works wonderfully with this bride’s simple up-do. If you’re having trouble choosing what to go for, remember that gold accessories tend to match better with ivory, off-white or champagne-coloured dresses. Try to keep your forehead band consistent with other accessories as well, so if you’re going to be wearing silver or white gold jewellery, your headband should be of the same hue as well. 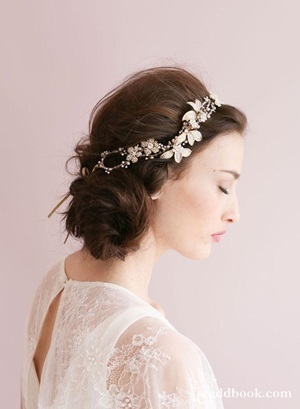 Bridal vines are the latest spectacular head piece trend to take the wedding fashion world by storm. These elegant accessories can be twisted and manipulated into different unique shapes to complement the contours of your hair-style – whatever ‘do’ you’ve opted for. They work well with braids, chignons and loose hair styles, and are fabulous for creating an individual, boho effect. 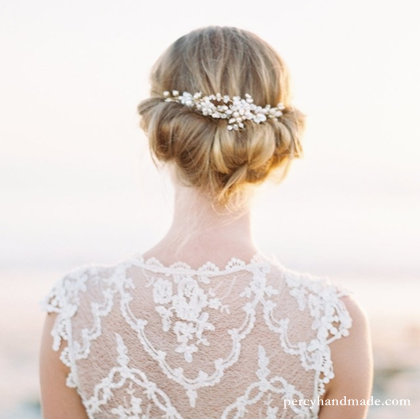 This bride’s beautifully delicate hair vine features both pearls and diamante details amongst the unique floral design, and the shimmering silver hue is set off perfectly against her dark hair. Last but not least, the bridal hair comb is a popular option for many ladies walking down the aisle. There’s an array of different styles to choose from, whether you want something quite traditional or something a little quirky. Combs tend to work best if they’re worn to accent an up-do, however, they will also work brilliantly if hair is worn loose and swept backwards on one side. If you’re having a beach wedding, then it’s the perfect opportunity to let the setting inspire you – perhaps a starfish or shell-themed design would do the trick?